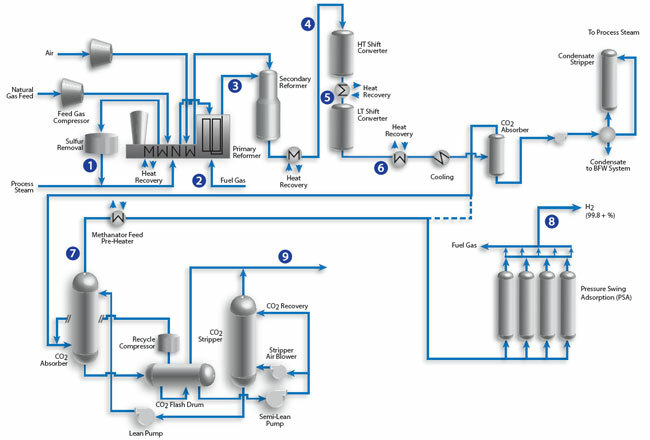 The majority of captive hydrogen is produced in refineries via Steam Methane Reforming of natural gas inside the refinery battery limits (ISBL). The output of the reformer is syngas, primarily a mixture of H2 and CO. The CO in the syngas is converted into CO2 and additional H2 using Water-Shift converters. Further processing purifies the syngas by removing CO2 via a CO2 absorber. In most refineries, Pressure Swing Adsorption (PSA) units play a major role in the final H2 purification process. Many of these gas streams contain high levels of steam, and the process conditions are severe enough to require special sample conditioning techniques. The Optograf™ Analyzer and integrated sampling interfaces address these sampling and analysis challenges.